We’ve had some gorgeous weather here in New England over the last few days, and finally (FINALLY!) it feels like Spring! The warmer weather is making us think of lighter fare and our lemony Chicken Piccata is the perfect option for a light and flavorful dinner. According to Wikipedia, piccata is a method of preparing food whereby the meat is sliced, coated, sautéed and then served in a sauce. 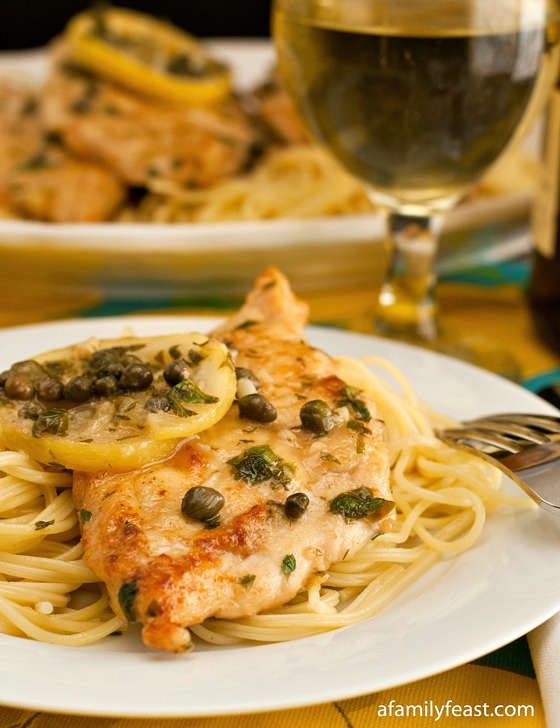 Originally prepared in Italy with veal, chicken piccata is a popular variation in the United States. The pan sauce for our chicken piccata is wonderfully tangy thanks to some zesty lemon juice and briny capers that are combined with chicken stock and vermouth (any dry white wine can be substituted) plus a little butter to give it some richness. This chicken picatta is quick to prepare and so delicious – it’s the perfect springtime meal! 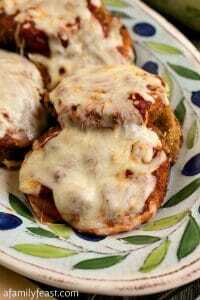 Pound out the chicken breasts to about ¼ inch thick and cut each breast half in half again so you end up with four servings. 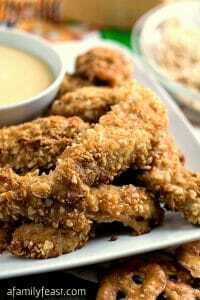 Place flour, salt and pepper in a flat dish or plate and dredge the chicken breasts until coated on both sides. Over medium high heat in a large skillet, heat the olive oil and one tablespoon of butter until slightly brown and frothy. Place the chicken in the pan and cook about 2 minutes on each side, until golden. Then remove the chicken and set aside on a plate. Reduce the heat under the skillet to medium. Add the garlic and sauté for another minute. Add the lemon juice to the pan to deglaze and scrape up any brown bits. Add the lemon slices, vermouth, chicken stock and capers. Cook for 3-4 minutes until the liquid is reduced by half. 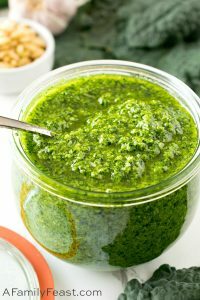 Stir in the two tablespoons of butter and chopped parsley and check for taste. Add salt and pepper if needed. Add the chicken back into the sauce and cook just until the chicken is back up to temperature and cooked through. Can I add heavy cream and capers? Hi Kim – This recipe has lemon juice as part of the sauce so the heavy cream might curdle – depending on how much cream you put in. (You can mix cream and lemon – it just has to be in the right proportions to avoid curdling.) Without testing out our own recipe with cream added, you could try this recipe instead: https://therecipecritic.com/2015/04/creamy-lemon-chicken-piccatta/ Hope that helps! Hi can you make this ahead for a crowd of 16? Sure Cara! It reheats very well! Great idea Christine! Sounds delicious! 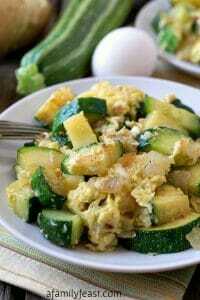 Looks like a super delicious dish!! I love quick to prepare dishes! 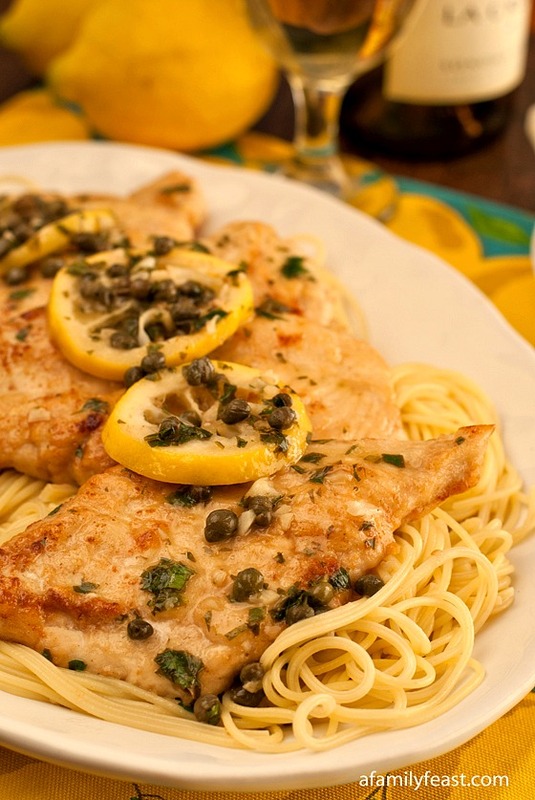 I have always loved chicken piccata!